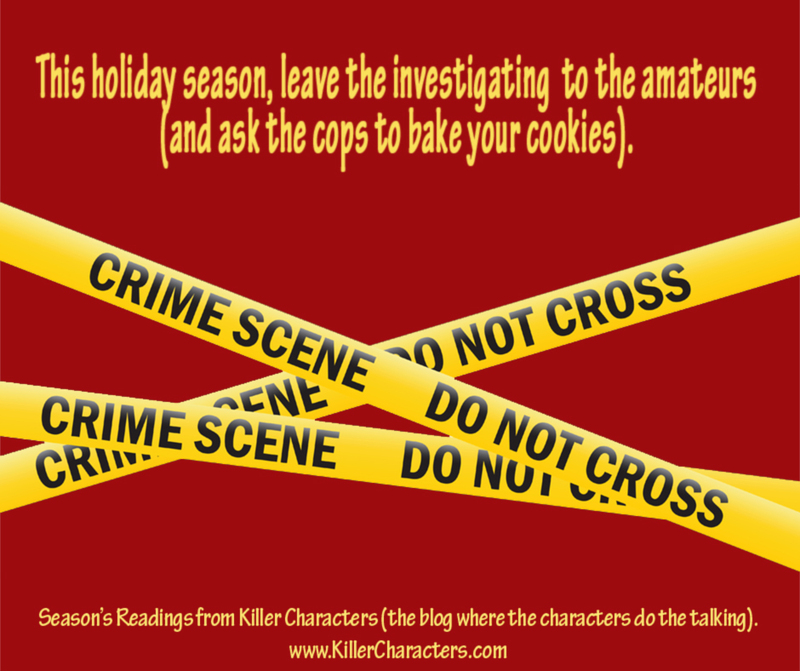 As the sign says, leave the investigating to me, an amateur sleuth. So far, my record is pretty good! I’ve tracked down several killers while keeping the Bar None dessert bar shop running, handling my employees and their problems, and chasing Quincy, my cat. He can move surprisingly fast for such a tubby guy, and he likes to scoot out the door whenever he can. Good luck getting cookies from the cops, though. Just sayin’. I’ll admit that I have a partner at the shop, Anna Larson, who is practically my grandmother. Really, I couldn’t do it without her. Since Quincy is reading over my shoulder and giving me a steady stare, I’ll also admit that he has helped catch the bad guys more than once. Wait, is that why he’s staring at me? Or does he just want his din dins? Look at the time. I’d better feed him. While I’m getting his Kitty Patty warmed up to put on top of his diet food (he won’t eat it otherwise), I’ll turn this over to my author. It’s me, Janet, the author. ‘Tis the season and I’m feeling generous. I find that I have five more copies of the second book in the series, FAT CAT SPREADS OUT, to give away to five readers for Seasons Readings. I’ll include bookmarks and cute Fat Cat sticky notes, too! Please leave your email below by midnight tomorrow, 12/5, (EST) to win. Below is a teaser for the giveaway book. Love the cover of your book and I would really Love to win your contest!! Thanks for this chance to win!! A great teaser thank you. I don't have a Fat Cat, but I do have a Pudgy Pug who has the stare for your din-din thing down cold. And I think he can tell time. He also does it when it's time for his medication that the vet recommended he have with a little chicken and rice. Good excerpt and great giveaway. Thanks! I laughed when I read about Quincy staring at her! I think he understood her and was unhappy he didn't get more credit for his crime solving ability (plus he needs his din-din). Thanks! I love a humourous cozy and I am sure Quincy will make me smile! I can't wait to read this after the teaser! Thanks for the chance! 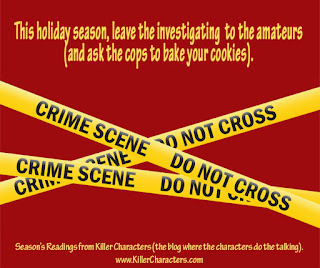 I was hooked at the Amateur sleuth graphic! Quincy reminds me of my former coconspirator Brutus. We had a decade of good times together. I just want to cuddle Quincy! Love this series! I really enjoy fat cat and would love to win this book. This is a new to me series, always looking for something new to read. This is a new to me author ... thank you for the introduction. Putting a cat on a diet is about as hopeless as trying to herd a bunch of cats! I have read the first book in this series, but not the second so thank you for the chance to win! Also, I wanted to say that I love the references to characters from other series! Thanks for the chance to win! I wish I could click LIKE on all of these posts! Thanks so much for all the interest. Don't forget to INCLUDE AN EMAIL ADDRESS. Otherwise, I can't get in touch if you win! I read this one from the library but would love to read the first one and the forthcoming ones. I love Quincy (and other cats). Love this, Janet. Thank you. I have not had the pleasure of reading any of your books yet. But am hoping this will be my first to read in the series. In any event the series in on my TBR. My book dealer is almost afraid to hear from me I have added so many new books to the list since learning of this site, Chatting About Cozies. I have learned of so many new authors. Been in 7th heaven for about 4 months now. The synopsis is most interesting. Looks like a good, fun, read. I have not read the second book yet. I loved the first one. Quincy is awesome! Love the Cover of this Book and I know Fat Cat will be up for giving us a great mystery...Thanks for the giveaway.. Thank you for the giveaway. I enjoyed the first one in the series. Quincy's not fat...he's fluffy! My four cats agree! Quincy looks like my son's cat, Boba Fett. About the same size too! Would love to give this book a happy home! Thanks for the opportunity! Love the cover. Would love to win the book. I like the idea that it includes recipes. Thanks for the giveaway opportunity. Thanks for your generosity to us fans! Merry Christmas! I adore Quincy. Thank you for the opportunity to win as I cannot buy books. I would love to read this next in this fun series. A cat series that is new to me is great! Because I serve as staff to 2 cats myself. Merry Holidays all around to everybody! Oh boy does that fat cat on the cover ever look like my parents fat ol' kitty. His wrinkles have wrinkles! They have also tried to get him on diet food but feared for their lives too much so compromised on a food that is better for him but still isn't 100% diet food. The series sounds brilliant and I'm off to further check it out when I'm done typing this post up. Of course, now I also want to raid the kitchen for ingredients to throw some cookies together! I don't think I've yet earned the respect it would take to have the local cops make them for me so I'm stuck making my own, sadly. I've gotten a kick out of all the personal cat tales! Thanks so much for posting them. I've picked 5 winners with random.org and will post them here by email and in the sidebar as soon as I get complete names. Congrats to you five winners!